Today: Who says birthday cake has to be classically beautiful? For her own birthday, Sarah is making a Japanese-inspired dessert -- boldy-colored and boldy-flavored -- that will renew your interest in cake (whether it's your birthday or not). Inspired by A Boat, A Whale, and A Walrus, in which Renee Erickson devotes an entire chapter to her birthday menu, I set out to bake my ultimate birthday cake -- and to do it unabashedly. I had my heart set on black sesame, a flavor with which I had a fast and furious relationship during a trip to Japan. I walked great lengths for cement-colored soft serve; I declined all red bean mochi, holding out for the sweet glutinous rice balls that would reveal a tar-black center; and I longed for the flavor -- more than I longed for fast trains or robotic toilets -- as soon as I got home. I wanted to include peanut butter and banana, too. It made sense according to the transitive property: Black sesame (nutty and slightly burnt) is the perfect complement to peanut butter (nutty and very sweet), and peanut butter is undoubtedly best when eaten on a banana. If logic rules, all three would play well together. 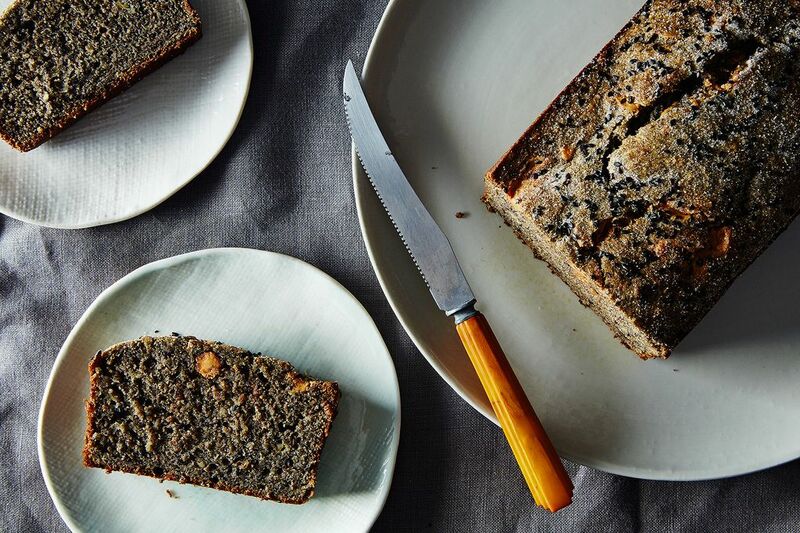 To make this cake, black sesame seeds are ground to a paste in a coffee grinder (you could also use a mortar and pestle and a set of strong muscles) and creamed into the butter and sugar base. Mashed banana is then incorporated into the batter to give the cake a dense crumb and to counter any tendency toward dry crumbliness, and finally, peanut butter is dropped on top and swirled in gently, creating pockets of sweet smoothness and a mottled crust. The resulting cake may be a bit drab for a birthday celebration -- more Soviet-era St. Petersburg than Jazz Age New York, more Teen Mom than My Super Sweet Sixteen -- but after the dizzying lights of the holidays, I’m reintroducing myself to earth tones. While this is not a New Year’s resolution "health" cake, there is something natural-tasting about its pleasant grit and slight bitterness. So what if my birthday cake isn’t miniature or covered in fondant or sprinkled with rose water or adorable in any way at all? This is my birthday. Before you make this cake, dare to look deep inside yourself and ask, “Do I like tahini? Do I wish tahini were even stronger in flavor?” If yes, proceed. 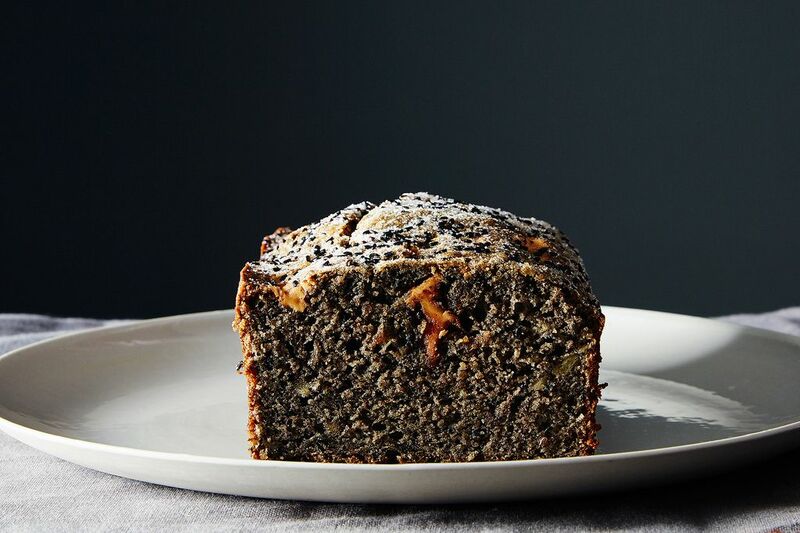 While the banana and peanut butter do tame the black sesame, turning the cake into something less exotic and more familiar, the flavor is still bold -- and divisive. I can’t force you to like black sesame, but I can plant a couple of candles in my birthday cake, try to blow them out in one breath, and make that wish. Hmmm, I wonder if a little miso would compliment that PB savoriness in the way a brown butter does. It makes a weird sublime kind of sense in caramel. Might here too. Just sayin'. Happy birthday SJ!!! Hope you got to have some of your birthday cake today! 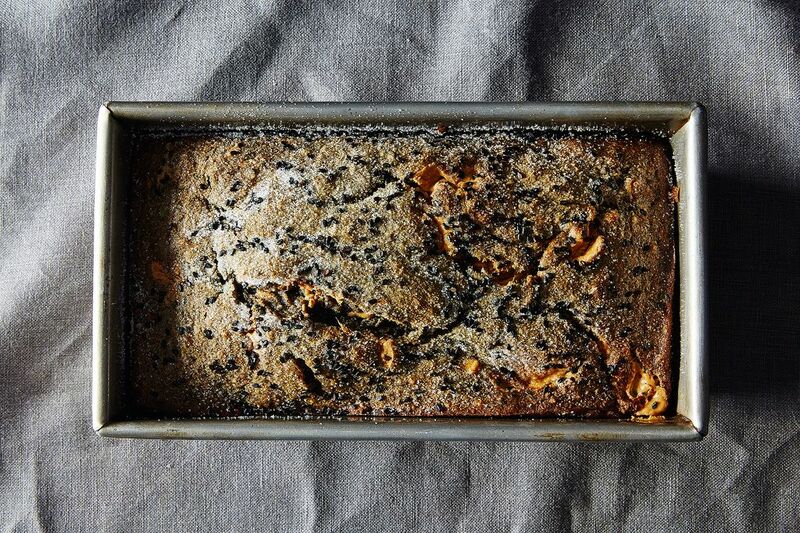 Can you use black sesame paste in this cake if you don't have the seeds? It looks divine, and I am going to make a painting that celebrates its austerity...then the cake. Do you use toasted black sesame seeds or untoasted? and ordinary mild in stead of buttermilk? Let's go back to Japan. Actually, let's just serve this on your birthday with a big scoop of black sesame ice cream and homemade mochi (makeshift tinfoil steamer?). But really, what a great looking recipe!! This cake is a bad mama jama (and beautiful! ), just like her mama. Happy Birthday, SJ! Thank you! I think it turned out pretty nice looking, even if it is gray. I find it really beautiful, actually -- I love that it's not just another birthday cake layered high with buoyant frosting. Sounds like the Asian type of not-too-sweet sweets I grew up with. Some coarse salt on top might be good.